The StarCraft community has a nasty habit of dissecting everything of value to them. Be it professional players, teams, organizations or scenes, they place their objects of affection under a microscope to scrutinize, analyze, criticize and question them from every angle. It’s not a surprising phenomenon. Every sport accumulates ardent fans and detractors at the professional level. This is normal and ought to be encouraged to a point. Without bias, visceral personal investment, and the crests/troughs of passion, the community for any sport cannot exist. Intellectual appreciation only works to a point; the basis for support must be emotional. But what happens when said emotions are taken as irreducible proof? The most obstinate result is reducing things to their most salient traits. Players are stuffed into neat little archetypes: title contenders, champions, upstarts, dark horses, disappointments, villains. Useful as shorthand to describe what is most pertinent, they function as the building blocks of narratives. As people who draw on them to frame the stakes of events, we TL writers are guilty of constantly indulging in them just to get articles out on time. Yet the terms become prisons when the term substitutes for reality. Scenes, teams, and races are conceptualized in broad terms fueled by personal gripes in place of nuance and balanced observation. Like in any sufficiently large community, the memes (Dawkins and otherwise) are inculcated by the loudest and more populous voices. Intelligent discussion is drowned out by the thrum of egos from advocates and dissenters alike. As a result, everything is filtered through a fixed lens. When players become caricatures, their accomplishments and failures are magnified accordingly. The true worth of their achievements, in the pluralistic sense, are irreparably warped: they become the product of imagination rather than fact. And woe to those who fail to live up to these newfangled expectations. In 2014, a largely unacknowledged KT Rolster Protoss named Zest rose to prominence. He had a breathtaking run of success that year, winning GSL Season 1, GSL Global Championship, and KeSPA Cup along with second place at IEM Toronto and a semifinal finish in GSL Season 3. It was a monstrous feat that rivaled earlier periods like Mvp’s 2011 dominance and Stephano’s vicegrip on the European scene in 2012. More remarkably, it was a tidal wave without foreshadowing. Zest didn’t hint at this level of prowess with promising showings in other places. Beyond a middling performance at IEM New York, he was still struggling to even qualify for GSL. His GSL victory against soO in which he refused to give up announced him to the scene as a resourceful, determined player. Less than a month later he defeated soO again and came back from the brink against PartinG in the Global Championship. Zest was starting to look immortal; the closer he got to death, the stronger he became. He somehow fell to Flash in Toronto, but showed completely mastery of PvP at KeSPA Cup. At this point it was clear Zest was a step ahead of everyone else in Korea. His play was crisp, forceful, decisive and reactive all at once. Zest seemed capable of anything. It didn’t take long for everyone to acknowledge Zest as an all-time great. Gamers being muscular and charismatic isn’t a foreign idea in the West. They pop up just often enough to ward off ignorant accusations that video games necessarily turn their victims into puddles of sugar-infused energy drinks and blocked arteries. It was strikingly incongruent for Korean pro players, who never buckled up their physiques despite KeSPA teams stressing the importance of regular exercise. Beyond questions of diet and fitness regime, Korean players also feel little pressure to take on stereotypically masculine personas. Their tendencies tilt towards modesty, emphasis on talking about hard work, avoidance of being too controversial or abrasive, a certain fascination with bowl haircuts. In short, the other traits that form the basis of the “faceless Korean” stereotype; just think about how homogenous their haircuts could be during group selection. Zest was as physically enviable as his contemporaries were normal, easy going when they would clam up, self-assured in contrast to their jitters and doubts. It was almost like he was the humbler reincarnation of Reach, the famous BW player who once declared “Protoss is a man’s race”. It was not an asterisk that overshadowed his play. But thanks to fans and casters fascinated by its incongruity, it became impossible to ignore. 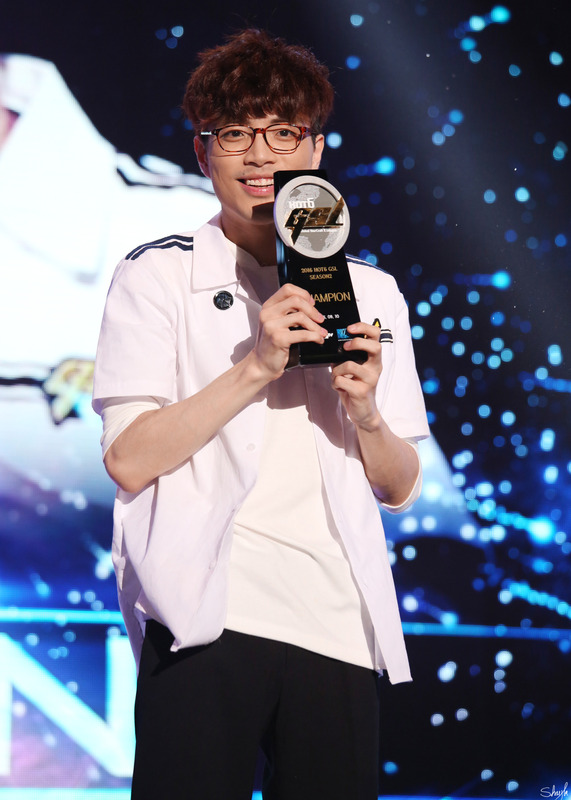 Once Zest burst onto the scene, he garnered a large number of fans and their loyalty. His reputation grew exponentially as every success reinforced his genial yet hypermasculine image. Instead of connecting with Zest based on his vulnerability and humanity, he impressed fans with his seemingly unflappable perfection. He combined the natural emphasis on winning with the type of enviable features that the esports demographic still latently pines for. It created a rare dynamic that was ultimately unsustainable. Post-2014 Zest has been stripped of his glow of invulnerability. Disbarring this year’s SSL and GSL Season there have been 11 Starleagues since the start of 2015. Zest has reached the semifinals once on his way to winning 2016 GSL Season 1, where he only lost one map on his way to the finals. Outside of that triumph, it’s hard to determine how stable he is as a player. He has alternated between frequent quarterfinals appearances and failing to qualify altogether (five times to be exact). Outside of the major Starleagues, he won IEM Katowice in spring 2015 and posted a 62% win rate in Proleague during the same period. This speaks to a mercurial player who suffers from lows as deep as his atmospheric peaks. He is not the same juggernaut that barreled through all obstacles unabated during his prime. When a lot of players have drops in form, it is visible in their mechanics or their build selection or their strategy and execution. It is rarely all of those things. Modern day Zest suffers in all those regards. He appears a step behind from the get-go, choosing disadvantaged builds and executing them poorly. His scouting is off, his decision making is lacking; he looks hapless. It's incredibly noticeable when Zest is in bad form. Simply put he flounders. The community expects his best at all times and is eager to leap on him when he does not deliver. What do we make of this inconsistency? Unsurprisingly the two most vocal opinions are the most extreme. One is that he has devolved into garbage. Since he can’t replicate his best historical showings, Zest must be a terrible player. This is further amplified by a sense of resentment: he shows up just enough to remind people that he can still play at a top level, then contradicts it with some blunderheaded mistake. The other is he remains the same man, but circumstances have connived to deny him of glory. Evidence includes the fickle strata of the Korean scene, the failures of most other Protoss players due to patches/race imbalance/limited options for gameplay/a foul wind sweeping in from the north. His heyday may be over but a lack of results doesn’t correspond with a drop in skill. External factors bar him from reclaiming his title of best Protoss player, nothing more. Realistically, Zest’s downfall was the same as every other champion. A combination of players catching onto and adapting to his style, meta changes due to patches and innovations in strategy/tactics, and bad luck with opponents knocked him off the top rung. Beyond that some of the more heavily criticized flaws always existed, masked by proficiency in other areas. Floating 1K+ minerals in the midgame is a standard Zest quirk; accidentally move-commanding armies into awkward fights has happened sporadically since he started playing StarCraft 2. These mistakes were amusing, even cute in a he’s-just-like-us way, back when they barely made a dent in his winning ways. Now they feel unforgivable. With all the minute errors in positioning, map awareness, scouting, and economy management, a single lapse along those lines becomes a grievous mistake. Zest is a player with an incredible skill ceiling. When he is operating at his peak, he is the perfect storm. His comprehension of PvT in early 2016 was unparalleled: he seemed to have mapped out every permutation possible and determined the optimal response. Zest was so good his Terran opponents could never find an appreciable advantage. He is also a player who, when he struggles, looks like a shadow of his former glory. Someone this inconsistent would warrant cautious optimism...or at least some sympathy. But rather than be patient with him, the community oscillates between praise and disdain in patterns as volatile as Zest’s form. While Zest is the product of his achievements, his image is the creation of other minds and voices. Too often its detachment from reality is taken for granted. It’s easy to forget given the year ByuN just had, but initially he was just another solid player in the early days of StarCraft 2. It was a period where most common strategies were in their nascent period, and players could find great success with one or two strong advantages; players like InCa and Rain could stumble into a finals berth and never come close to replicating such results again. ByuN emerged from that era with two round of four appearances. He lost on both occasions, the victim of Losira and the forgotten champion Seed. But fans come to associate him with something entirely different. The fact that ByuN brought his puppy to team league was his most memorable contribution pre-HotS. Yes, the man who would one day be deemed the best player in the world was more forgettable than a dog. For reasons no one fully understands, ByuN retreated from the public eye for much of HotS. When he did play, he failed to exhibit the form that make him a classic underdog. ByuN became a running joke instead. He was turned into a fugitive from KeSPA, a daring bandit who refused to succumb to their dastardly plot to assimilate all Korean SC2 under their wing. It was a great joke with long legs. But it didn’t reflect ByuN as a player of prestige or note. All of that changed with the release of LotV. ByuN started to build up steam from the get-go. His results in online tournaments captured the attention of foreign fans, just as his relatability and outgoing, everyman personality won over reluctant Korean fans. He gathered momentum as the year went on, picking up a larger and larger following as the results improved. By the time he seized GSL and BlizzCon as spoils of war, one would think he was the second coming of MVP. Scratch that, MVP wasn’t even worthy of fetching ByuN’s coffee. Of course ByuN didn’t order the community to lavish him with praise. He didn’t tout his micro as the best ever. And it wasn’t ByuN that told Afreeca and the community to run with the narrative as him being a man fighting against the establishment. He was just playing in the only way he knew how: with tenacious, single-minded dedication. This dogged determination happened to coincide with LotV changes that stressed the primacy of multitasking at the expense of simplifying overall strategy. ByuN was an impressive mechanical player with a good sense of when and how to attack, and he had a unmatched feel for the pacing of the new expansion. At the same time the general dynamics of LotV obscured many of his weaknesses. ByuN mastered a style of applying continuous pressure onto the opponent, usually starting with drops and transitioning into a series of progressively more oppressive timing attacks. It happened to be the perfect antidote against Protoss, who were shying away from colossus-based unit compositions, and the mutalisk had been nerfed out of competitive viability. This granted ByuN unrivaled freedom to harass worker lines and chip away at the enemy’s main force without concerns about counterattacks or flanking; it also allowed him to solely focus on controlling engagements without being distracted by attacks elsewhere. By no means was his play perfect. There were holes in his defensive multitasking, splitting, and build orders that could’ve been exploited in other metas. In fact they appeared time after time whenever ByuN’s initial approach failed to outright win the game. Nevertheless such flaws were ignored during the height of his success. People didn’t just fail to recognize them, but actively refused to acknowledge their existence. During the backend of 2016, the drive to hype up ByuN as World’s Greatest Terran™ overrode any competing desires for honesty. His ascension to the top was characterized by a concerted effort to frame him as the historical crème de la crème. In retrospect one could hardly blame figureheads for ballooning ByuN to the status of living legend. Between the dread over waiting for another KeSPA organization to disband its team and uncertainty regarding Proleague, competitive StarCraft was in a fragile state. The Korean scene may not have been the most popular or unifying aspect of the game’s international presence, but it had become all but indispensable. It was the venerable institution that proved StarCraft could be serious, sustainable, and influential beyond its niche audience. Without Korea competitive SC2 would be reduced to the equivalent of a well-meaning but hapless amateur league. It was imperative to reassure the community that the seismic shift occurring on the other side of the planet was just a shift. By the time BlizzCon rolled around, every single caster of note banded together to systematically erase all memory of StarCraft 2 prior to that moment. The agreed upon tagline was “highest skill era”. They had an unspoken contract to be as relentlessly optimistic as possible, and that involved praising all aspects of the game at a breathless pace. Since ByuN was the latest Terran champion he had to be the greatest Terran in the game’s history. Maru's micro against Protoss was irrelevant. GuMiho's drop harass was too boring to remember. TaeJa’s reactionary prowess was left unmentioned; beyond early ravager pushes, Terran didn’t even bother to defend anymore. The casters drilled this rhetoric into the minds of the community every chance they got. Whether it was a proper reaction to events was besides the point. It culminated in a Dada-esque scene where Tasteless and Artosis were transformed into gushing cheerleaders over ByuN target-firing slow banes off creep. Listening to their praise alone you’d think it was the epitome of TvZ fights. There’s a good reason we rarely saw this pre-LotV. No, it had nothing to do with players being “worse”. Since BlizzCon results haven’t come as easily for ByuN. Many of his recent struggles can be traced to specific game changes: the reintroduction of mutalisks, the removal of tankivacs, the slow disappearance of the 16 marine/2 medivac push in TvZ. Undoubtedly opponents have studied his gameplay and learned to exploit its most salient features. But the least esoteric source of his troubles may be his personality. It’s well known that ByuN is supremely emotional when playing. He dedicates so much of his identity and time to the game that failure, no matter how small or uneventful, wounds him to the core. He is a player who agonizes over every misstep, no matter if it’s in a group stage or the finals of a premier event. ByuN’s visible despair when losing at IEM paints an especially tragic figure. It almost seems as if the stakes have been upped. He has the weight of the community behind him. But just as they can support him, the expectations can be crushing. ByuN is beloved and his play is showered with commendation. But sometimes a person doesn’t need to be told how good they are. They just need to get back to what they were doing. What made them great in the first place. ByuN hasn’t become a bad player by any stretch of the imagination. Like all champions, he has returned to Earth after soaring among the clouds. Yet he didn’t fall by flying too close to the stun of his own accord; he was catapulted to those heights by the uncritical praise of others. And when things slipped and the waxen wings fell apart, he crashed to Earth under the unbearable weight of a community’s hope. Zest and ByuN might only earn a modicum of sympathy: they can afford to dry their eyes with money and acclaim. Those who suffer the most are the middling players. The nobodies, the unspectacular and ordinary are mired in stagnation, constantly striving to find a foothold only to fall back to the starting line. Players like Billowy or Trust are recognizable for mediocrity more than anything else. Their performances are consistently underwhelming. Nothing is expected of them. And with such perceived mediocrity comes the assumption that they will never break that trend. The sad fact is that in a scene full of heavyweights, minor players simply cannot gain the momentum required to extricate themselves from that quagmire. It’s easy to forget every player in the Ro32 is in the 99th percentile of all StarCraft players. The difference in skill between a gatekeeper and Stats seems huge within the game, but the gap is composed of an accumulation of minor details. In reality they are the best of the best. To forget that fact is to undermine a player’s legitimacy. Moreso it whitewashes how hard it is to even maintain a presence in Code S.
Then there are players haunted by the past. Where they are on a personal level is irrelevant, for the community will cling to their past achievements like a malignant specter. Leenock and jjakji are prime examples of players whose best days are behind them. Though playing at a highly competitive level, it’s impossible to deny that they are no longer elite. In a stroke of happenstance, both participated in the same Round of 32 group in 2017 GSL Season 1. They were the players with the most GSL finals appearances among the four, but Cure and Dark were the favorites (or at least the players with the most recent success in premier events). No one batted an eye when jjakji promptly fell out of the group. It was expected that a player past his prime couldn’t compete. Rises in form are most commonly viewed with amusement for that reason. He can win, but public opinion says he will fail soon enough. And that’s exactly what happened for Leenock. While he advanced in second place, he was given little credit; when he was bounced from the round of 16 without winning a match, existing prejudices were validated. He just doesn’t have what it takes anymore. Every game jjakji and Leenock play is framed against their triumphant pasts. It is almost impossible to match them and, as Leenock discovered, positive results aren’t celebrated, they are diminished through comparison. The community views them as a shadow of their former self. They almost become a novelty, summed up in a single joke. When the community strips a player of their viability as a challenger, it undermines the entire scene. Suddenly all events are decided between a few players. Why should Leenock and jjakji even compete when INnoVation will be playing the current best Protoss in every final? Beyond its more careless acts of denigration, the community has a soft spot for deifying its favorites. Zest and ByuN are the latest in a long line of players who are more than human in the minds of their most loving adherents. Adoration comes in torrents along with clout and commendation. But with respect and love comes impossibly high standards. Players are made out to stand for something greater than themselves, and supporters can lapse into resentment and anger when that illusion is broken. Every player loses, but it rarely matters when the average ones do. Everything is magnified for community darlings; more often than not, unreasonably. The lure of a neat, easily digestible structure is irresistible. Once established as a “kong”, “a champion” or “an underachiever” it turns a player into an intelligible entity that fits into the larger lattice of the scene. The projection, pigeon-holing and classification involves allows fans to easily compartmentalize their emotions and focus on what they care most deeply about. For casters and writers, it grants us inexhaustible opportunities to organize a scene that would be confusing and overwhelming otherwise. You could say these archetypes are the basis of narrative. Without them, how could we one ascertain whether one match is more compelling than another? How would we convince you a tournament final has real stakes beyond the obvious? The danger is the old clarion call about words and their power: once we describe something, we also dictate its meaning. It is far easier to stick to a standard once it’s established rather than continually update our assumptions. The veneer of being a “champion”, “the bad boy”, “X Jr.” is a matter of image that exists outside of the player’s control. Unless the individual is canny about swaying public opinion, they are liable to become outlines of people instead of people. This type of radical simplification extends to their accomplishments too. Whether it be during their careers or after they have retired, the community’s interpretation of achievements mean more than the achievements themselves. Neeb’s KeSPA Cup win is a towering achievement because he was the first foreigner to win a tournament on Korean soil in decades. soO’s is a pleasant aside at best, a meaningless act of futility at worst for reasons we all know. Lost in all the edification is what those victories meant to them. Ultimately, the history of StarCraft 2 is recorded by the community rather than the players. That power resides with the loudest and most insistent spokesmen, whether those are casters, writers, tournament organizers, or your frequent TL poster. It's impossible to resist bowing to personal prejudices and favoritism, particularly for those with the platform to influence others, but greater care should be taken to consider a wider range of opinions rather than blindly deciding one is "correct". The StarCraft community is a passionate one, and tensions will often run hot when it comes to divisive issues. Taking pause to consider each event from a wider perspective paints a much fairer picture. Well this won't be controversial at all, will it..
"There’s a good reason we rarely saw this pre-LotV. No, it had nothing to do with players being “worse”." Very well written article, I hope the players and fans alike adopt a more reasonable approach to supporting the scene and the players themselves. TL writers are trash, always fawning over the same player and bashing others and viewing the SC2 fanbase as flithy know-nothing plebians. Those players were too strong, but their imbalance got patched in LotV. If it is about Byun target firing Banes of creep... they are usually non speed banes and due to the Hotkey Change "all" you have to do to target fire the banes in lotv is hold down A and hover over them and they will die. So you no longer need to a click them and be scared of missing one. But kind of weird to write such a statement without offering a closing to it. Why don´t you address next time the immortal, the unique, the unfathomable, the unbeatable titan that STXSoul Dear was during the months prior to Blizzcon 2013? Well written article, but favoritism happens in all sports. I believe that the community will always pick a favorite for whatever reason. Be it a more interesting personnality, more interesting style or even being new. Fans have always dismissed players or teams in whatever sport. Fans always expect the best from their players, and the moment it goes bad they will insult them, calling them washed up, B tier, or just bad. This won't change. Fans always want a champion to hold the "bonjwa" banner. If last years champ can't do it, he must be bad and they will hop unto the next bandwagon. I believe thats always what happened. There’s a good reason we rarely saw this pre-LotV. Uh. This definitely happened a lot pre-LotV. That's one thing that hasn't changed at all. Nothing has changed about target-firing banes. The reason we see it now so often is because of the rise of the 2/1/1 build which gives a ton of opportunities for target-firing banes. If we exclude that it was a ro8 at an IEM and a ro8 in GSL. After winning GSL in January he failed in GSL March with a ro24 finish, in GSL May he only played code a (got second there), lost in the ro32 in a GSL super tournament and in GSL July he failed again in the ro 24. So from february till august he won that world championship gsl (which was a joke to begin with) and at the rest of the tournaments he did really badly. That were about 6 months of mediocre results until he stepped it up at the end of the year and actually had great results. If anyone else had the bad results of Mvp after winning that GSL the "reign" would have stopped in these 6 months for sure. No Mvp didn't dominate 2011, he dominated from august till the end of the year. Well you are right that narratives trump actual analysis a lot. But this is simply the product of fanculture and happens everywhere. It's easier to say player x is bad (in the context of the very best) even though he plays in code s (almost) every season. Like you mention leenock here. The truth is that he will probably never be in another GSL final, i am sure he trains hard and is really good in general. But in korea he is still one of the weaker players if we only look at the korean scene. You just proved my point. twice the opportunities to win also means twice the opportunities to lose (not make a top 4 finish) he played in an era with far more competition, when the game was just being figured out, and still managed a dominating record. in my mind the two aren't even close. MVP won gsl code S TWO TIMES in 2011, as well as winning the GSL World championship. He also came in 2nd in Code A in May, 2nd in Code S in October, 3-4th in Code S in November, won an MLG, and won Blizzcon 2011 as well as World Cyber Games 2011.
tell me in what world Zest's GSL championship, (i'll admit this one championship is worth both of MVP's Code S championships because of the frequency of gsl tournaments back then) his GSL global championship (equivalent to MVP's GSL world championship title) and Kespa cup championship are equivalent to MVP's two Code S titles, GSL world title, MLG, blizzcon, AND WCG?? you're basically saying that winning a kespa cup is the equivalent of winning a Blizzcon, WCG, and MLG. i wholeheartedly disagree. zest winning his one gsl in 2014 is about the same as mvp winning code S twice in 2011.
sorry, but a single kespa cup victory is not equivalent to winning blizzon 2011, MLG anaheim, and WCG 2011. Two GSLs according to how the community counts them for Mvp and Life. Why do you only look at actual championships? What about all the mediocre results i just listed? WCG is not that impressive anyway, let's be real for a moment. You are saying extra tournaments is also a chance to do badly, well yes but it is a chance. If you are actually really at the top of your gameplay you would rather have a lot tournaments to play in and not be scared to do worse in the others. Fact is that Zest did well in every single tournament besides the blizzcon where he had to play the later crowned champion in the first round. At every other tournament he made at least ro8. Mvp did way worse, especially in the 6 months i talked about in the comment you quoted. Zest didn't win as much a) because there weren't that many tournaments and b) it was the most competitive era in sc2 period. Well code s titles then I think it is worthwhile to make a distinction here.